Please Join Us For This Gala Occasion! 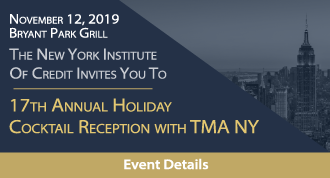 Don't miss this opportunity to ring in the 2018 Holiday Season with more than 600 of your fellow industry colleagues over an unlimited top shelf bar, an elaborate array of hors d'oeuvres and delectable buffet dinner. This opportunity only comes around once a year! Year after year, registration for this reception reaches maximum capacity and sells out prior to the eve of the event. Please be sure to register early! If you are presently an NYIC member, to capture the NYIC Member registration fee, enter promo code BLOOM during the registration process at: Step 2, Mailing Address Information, bottom line of form. Please note that all NYIC memberships will be confirmed post registration.